Artist David Hockney is widely considered Britain's most popular artist whose work is celebrated the world over. His exhibitions generate huge excitement, attracting millions of visitors. Director Phil Grabsky gained privileged access as the artist prepared for two remarkable exhibitions at London's Royal Academy of Arts. 'A Bigger Picture' explored Hockney's return to his native Yorkshire where, using innovative techniques and technologies, he captured the landscape as it changes across the seasons. For '82 Portraits and One Still Life', viewers see Hockney at work under his self-imposed deadline of 3 days for each painting. 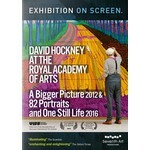 Weaving throughout the film are relaxed yet incisive conversations between Hockney and The Royal Academy's Artistic Director Tim Marlow. These and expert insights from art critics Martin Gayford, Jonathan Jones and Edith Devaney, Senior Contemporary Curator at the RAA, allow us to get to know the affable and articulate man behind the 21st century master.